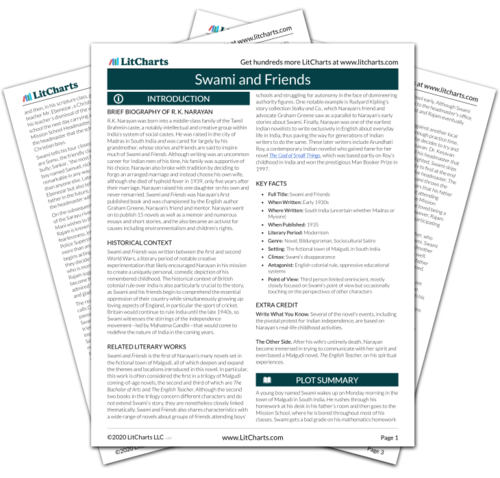 Instant downloads of all 946 LitChart PDFs (including Swami and Friends). 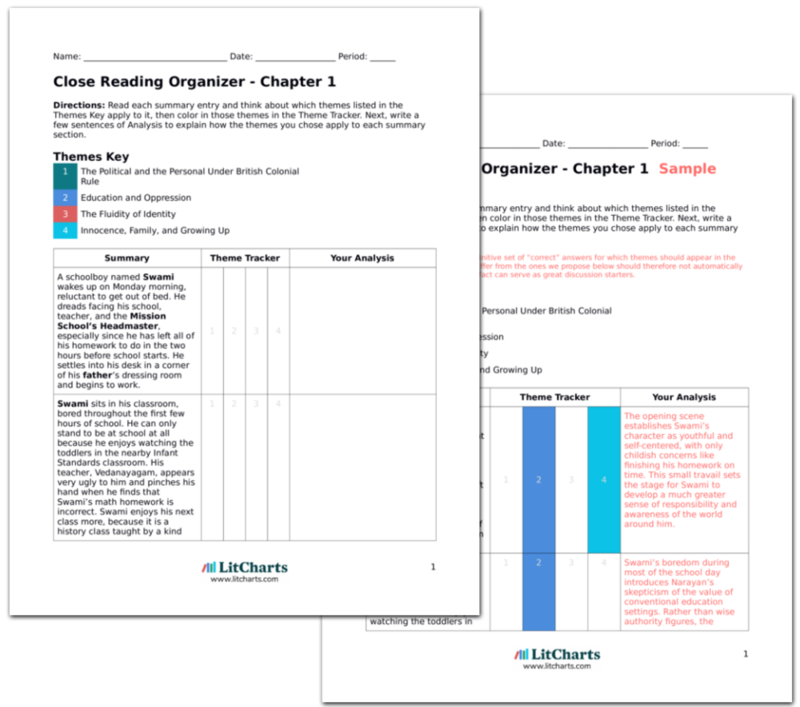 LitCharts assigns a color and icon to each theme in Swami and Friends, which you can use to track the themes throughout the work. Three weeks later, Swami and Mani are on their way to Rajam’s house. Rajam has invited them to his house, telling them that he has a surprise waiting for them. On the way, Mani muses about the ways that he’d like to inflict violence on Somu, Sankar, and the Pea. When they arrive at Rajam’s house, Rajam peeks out but then closes the door again. To get him to let them in, Swami pretends to be a blind kitten and Mani and blind puppy, mews and barking at the door. Rajam opens the door and the two enter, still pretending to be animals with their eyes closed, while Rajam barks and mews in response. Swami and Mani’s humorous transformation into baby animals is one of the more comedic instances of fluid identity. Their joking willingness to give up their true identities allows them to enter a situation where their friendships will be repaired, showing that changing identities can function in positive ways as well as negative ones. When Swami and Mani open their eyes, they discover that Somu, Sankar, and the Pea are in the room with Rajam. Swami is embarrassed at his behavior and Mani becomes angry at Rajam, threatening to leave. Rajam comforts both and convinces them to stay, offering everyone a snack. After they all eat, Rajam gives a long lecture on the value of friendship and all the terrible things that the Vedas say will happen to a person who makes enemies. At the end of his lecture, Rajam asks the other five boys to swear that they won’t have enemies any more, and offers them each a gift if they do so. Rajam’s eloquent defense of friendship, drawn from a classic Indian text, is an example of the boys’ growing maturity and attempts to relate to each other in ways not defined by Britain’s influence on their country. However, Rajam’s authority still derives in part from his father’s powerful position, which complicates his pacifistic request. The Pea is the first to accept his gift and the other four boys soon do the same. The Pea receives a fountain pen, Somu gets a new belt, Mani gets a new knife, Sankar receives a bound notebook, and Swami gets a green clockwork engine. The boys’ acceptance of gifts from Rajam adds an ironic spin to Rajam’s convincing lecture. Perhaps the boys have matured enough to take his argument seriously, but perhaps they simply want the gifts. Again, Swami and his friends are stuck between childish desires and newfound maturity. Sheldon-Dean, Hannah. "Swami and Friends Chapter 6." LitCharts. LitCharts LLC, 23 Jul 2018. Web. 11 Dec 2018. Sheldon-Dean, Hannah. "Swami and Friends Chapter 6." LitCharts LLC, July 23, 2018. Retrieved December 11, 2018. https://www.litcharts.com/lit/swami-and-friends/chapter-6.